Agrohack event producer Carlos Cobián discusses details of the upcoming event, flanked by a group of collaborators. Looking to add to the island’s efforts to promote agriculture as a sustainable source of growth and economic development, a group of entrepreneurs will host Agrohack, a conference focusing on the sector, on May 28. The event will bring together various components of the industry, such as farmers, agribusinesses, agronomists, educators, food executives, distributors, suppliers, vendors, , government officials, transport companies and technology providers, among others. 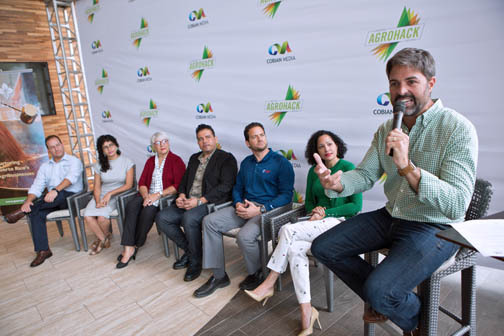 “Agrohack is for anyone interested in joining Puerto Rico’s agricultural industry and see it prosper and explore it’s full potential,” said Carlos Cobián, founder of Cobián Media, and producer of Agrohack. Agrohack has also been designed to inspire and attract the attention of young people and students in the agricultural sector, because in the next five years, according to a report published in 2015 by the U.S. Department of Agriculture, there will be job opportunities in areas directly related to food production, agriculture in general, and sustainability of resources. The conference agenda is packed with lectures on mainstay topics such as agro-industry, innovative financing for agricultural projects, new methods of agricultural production and reducing food waste. In addition, security issues, marketing agriculture, trends and new agricultural technologies that are changing the island’s landscape will also be discussed. Hey Buddy!, I found this information for you: "Agrohack conference to focus on innovation, tech". Here is the website link: https://newsismybusiness.com/agrohack-conference-to-focus-on-innovation-tech/. Thank you.